News Daily: New Magpies speak Hear from Will Hoskin-Elliott, Lynden Dunn and Derek Hine as they spoke to News Daily at the completion of the 2016 AFL Trade Period. Will Hoskin-Elliott will join former teammates Adam Treloar and Taylor Adams as a Magpie in 2017. Will Hoskin-Elliott is a step closer to realising his childhood dream of playing in the Black and White, after a deal was struck between Collingwood and GWS on the final day of trade. The Giants young gun grew up barracking for Collingwood and arrived at the Holden Centre in exchange for the club’s future second round pick. Hoskin-Elliott has played 52 games since being drafted by GWS with pick four in the 2011 draft. 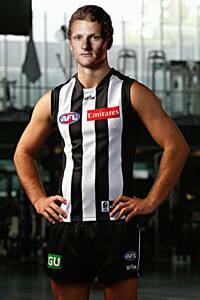 He joins former teammates Adam Treloar and Taylor Adams in the Magpies’ midfield. GM List Management Derek Hine said his combination of elite speed and endurance makes him an exciting addition. “Will is an elite talent, someone we thought highly of as a junior and a player we have tracked throughout his career,” Hine said. “There is tremendous upside in Will. With good hands, speed, excellent ball use and versatility, he has the tools to be a quintessential modern player. The 23-year-old said he already feels at home in the Black and White. “I used to go for the Pies when I was younger so I’ve always loved them,” Hoskin-Elliott said.